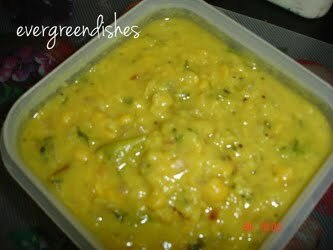 Mix the three dal together and pressure cook them. Take the oil and ghee in a kadai, add cumin. As it splutters, add grated ginger, green chilly, termeric powder and onions. Saute till it becomes light pink, then add tomatoes. Allow to cook. Now, take the cooked dal and mash it well. Pour it into the kadai. Add salt. Let it boil for sometime. Serve with roti or nan.